Find an efficient way to clone SSD to HDD can greatly help you save the time in reinstalling Windows and applications. AOMEI Backupper is the most suitable tool for you. Why clone SSD to HDD? SSD is the abbreviation of Solid State Drive. HDD is the abbreviation of Hard Disk Drive. They have many different features in many aspects. But the similarity of them is both of them are storage device. The main reason that you want to clone SSD to HDD may be the insufficient memory or imperfect performance of your computer. With the daily use of computer, you may find the running speed of your computer increasingly slow. And during the process of any operation on your computer, the space will be occupied by the waste produced by every thing you do. To get the best computer performance and free up more space on your hard drive, cloning SSD to HDD is one of the most efficient way for you. The horror of having to reinstall Windows again and all of your applications begins to set in. 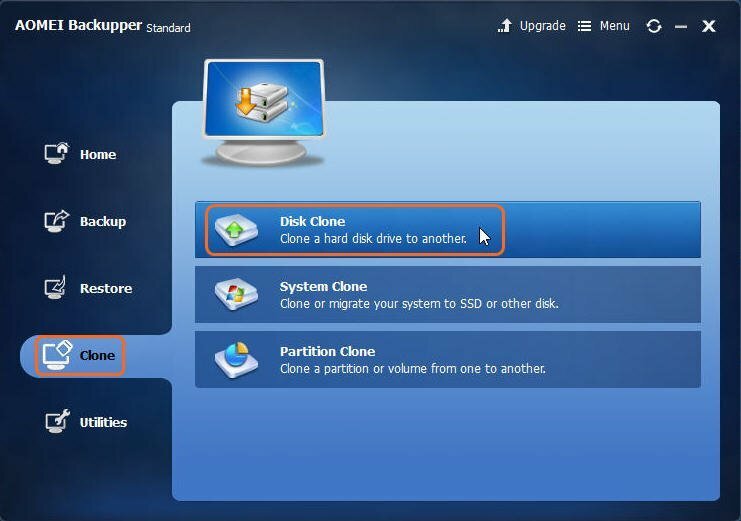 If you don’t want to deal with the hassle of reinstalling Windows, you can use a simple cloning utility to clone SSD to HDD. After talking about the necessity of cloning SSD to HDD, the primary thing you need to consider is which tool is the best suitable for your acquirement. Through deeply research on cloning software in the market, we finally find AOMEI Backupper is the best suitable one to clone SSD to HDD. AOMEI Backupper is a clone software which can clone SSD to HDD in a time saving and energy saving way. Besides, its intellectual user interface makes it an easy to use software. And the good news is that it is free of charge, you can use it for not only cloning, but also backing up. Therefore, there’s no doubt that AOMEI Backupper is the most suitable clone software to clone SSD to HDD. How to clone SSD to HDD using AOMEI Backupper? After chose AOMEI Backupper as the tool of SDD to HDD clone software, what we should consider is the detailed steps to realize this operation. I will show you the detail of how to clone SSD to HDD using AOMEI Backupper. Step1. Download AOMEI Backupper, install it. Plug the HDD using an available SATA cable. Click Disk Clone under the Clone option. Step2. Select SSD(Disk0) as the source disk that you wish to clone. Click Next. Step3. Select HDD(Disk1) as the destination disk which you clone source disk to. Click Next. Step4. Browse the Operation Summary which indicates the operation will be executed in the clone process. Confirm all setting are right and click Start Clone to begin the process. You can set some other details in the left page of the Operation Summary. There has three options. First, “Edit partitions on the destination disk” means you can partition your hard drive in this option. The second one is creating a “Sector by sector clone”. That means the clone result is the same as the source disk, even there is no data on some sectors. And the last one is checked in the situation which your destination disk is a SSD. 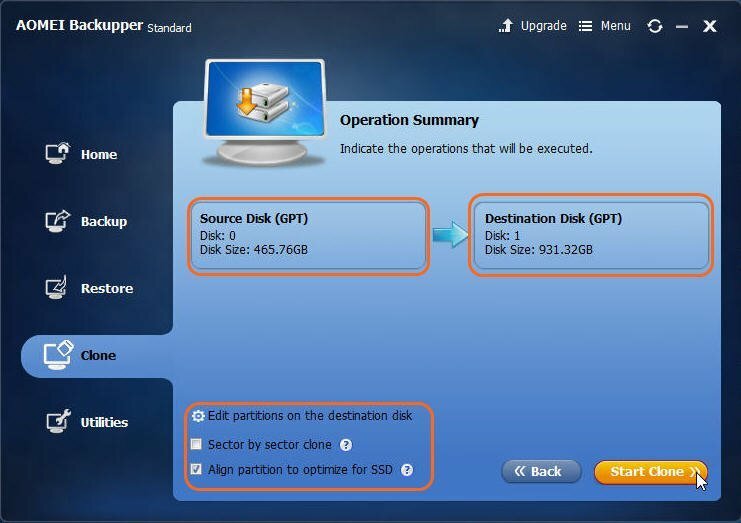 By checking the box, you can align partition to optimize for SSD.